Saturday I worked on the barn until later than usual, and on my drive home I felt worn out and undone. I drove home the back way, slowly, one hand on the wheel, the other hanging out the window. Every so often, I’d raise my hand to catch the breeze, float it on the push of air, a small airplane of flesh, blood, and bone. But soon even this required more effort than I wanted to expend, and I let it rest heavy against the truck door. Then, a raven, flying just ahead of and above the truck, tracing the road’s path. Thirty miles an hour he flew, or nearly so, and he stayed with me for almost a mile. Leading me. Being pushed by me. No, that’s ridiculous: Just flying. I watched, an eye on the bird and one on the road, until we came to a field and the trees opened and he cut a hard right over the long expanse of grass, and for the briefest of moments, one of those fleeting fantasies in which the laws of both physics and man can be unwritten, I thought about turning with him. Had you gone that way, Ben, you would have met me. Nicely written. I’ve had those moments, tuning in with nature. Beautiful. Between this, and the carpenter pencil of saddleback, – this writing makes my day. 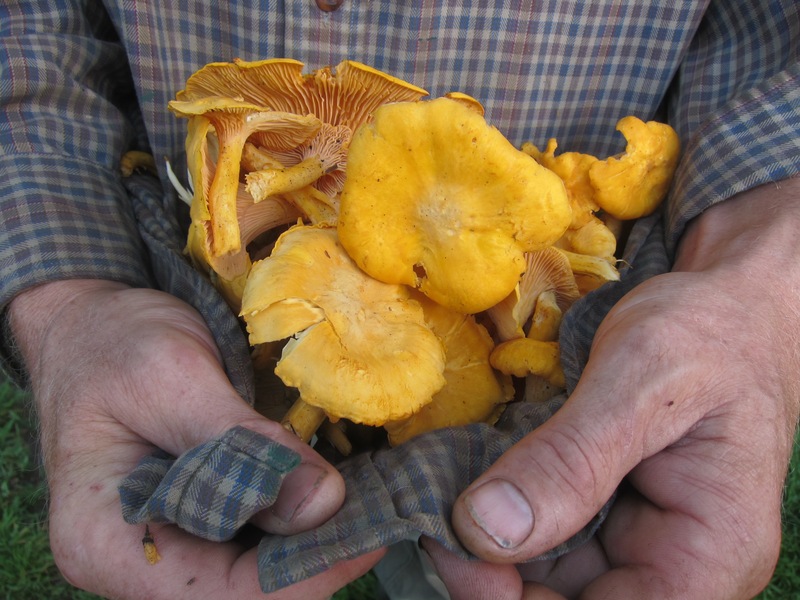 Did you know that chanterelles in Lithuanian language are called “Squirrels”. We found some here already also. I did not know, but apparently they are antibiotic and de-worming also. Just so good with fresh butter, onions and potatoes. Forget the raven, I would turn wherever chanterelles are. Bee, there’s nothing like a red carpenter’s pencil to keep you Happee. Love the ‘shrooms, too. Where I live, I recently found a hidden expanse of black trumpet mushrooms….it’s gotten me quite hooked on being able to recognize what I see! flying scares me. I just wanted to keep following in my truck. Since you mentioned reading Chris Hedges the other day, I thought you might be interested in this speech of his. He, and Marx, make a good case. Beautifully written….those surreal moments have kept me sane in this lifetime…….Thankyou……. Love ravens, crows, vultures, all the birds many people seem to think of as nuisances. Wonder what he was thinking about you as you traveled together? Me too! Maybe there was communication happening, the non-talking kind…. The raven was me. It seems I can’t resist myself. Know exactly what you mean…. I felt like I was You while reading this, you did such an amazing job describing such a common activity! You have such a gift and I am thankful to read your blog. Saddleback had an essay and it had a line about green beans in the garden, and I felt similarly about his writing. Unfortunately I bookmarked his and it is now gone. Thanks for sharing your thoughts and experiences! Your hands look exactly like my father’s, even down to the banged up leading edge of the thumb nail. Anytime I see a person with those hands it’s like a familiarity I can’t quite describe – like I know those trusty tools have accomplished enormous things and I sense the strong character behind them. Nice photo. I agree. I wanted to comment that I liked this photo as well.